Originally a town built to service goldfields, today the gold Cairns deals in is tourism – millions pass through here every year in search of the topical trio – reef, rainforest and beaches. Cairns is a cosmopolitan city with a melting pot of cultures and this is certainly represented in the variety of cuisines on offer. From five star Australian contemporary bush tucker fusion at the Red Ochre Grill to Islander, Asian and Mediterranean, Cairns has it all. There is also a strong café culture here too. Cairns has a very lively art community, recently adding the ultra cool Cairns Centre of Contemporary Arts on Abbott Street, which opened in April 2004. As an international destination, the shopping in Cairns is world-class. International labels stands side-by-side with duty free stores in palm-fringed inner city streets. There is a hustle and bustle about Cairns, but with that languid tropical undercurrent, things never get too hectic. A focal point for Cairns is the Foreshore Promenade, a precinct that encompasses recreation and fitness, an abundance of restaurants, and cafes and picturesque views across to the Marina (not to mention the wonderful water park). Over at The Pier complex, you’ll discover the plethora of tours leaving for the Great Barrier Reef – have a wander and pick up some brochures and then enjoy a coffee watching the boats come and go as you plan your own aquatic adventure. Indeed Cairns is the perfect hub from which to access an almost mind-boggling array of tours. To get the most of these areas, we suggest hiring a car and planning to stay at least three days in each area that interests you. For many, Cairns will be the perfect base to start a driving holiday in the region. For tropical garden lovers, the Flecker Botanical Gardens are a must. Visit Kuranda on Sky Rail or the Railway and experience Rainforestation, a koala and wildlife park, with Pamagirri Aboriginal Dreamtime Dancing included in the ticket price. More inspiring aboriginal culture can be found at Tjapukai Aboriginal Culture center, next to the Sky Rail terminal. Cairns is blessed with some beautiful beaches, many within twenty minutes drive from the centre of town. 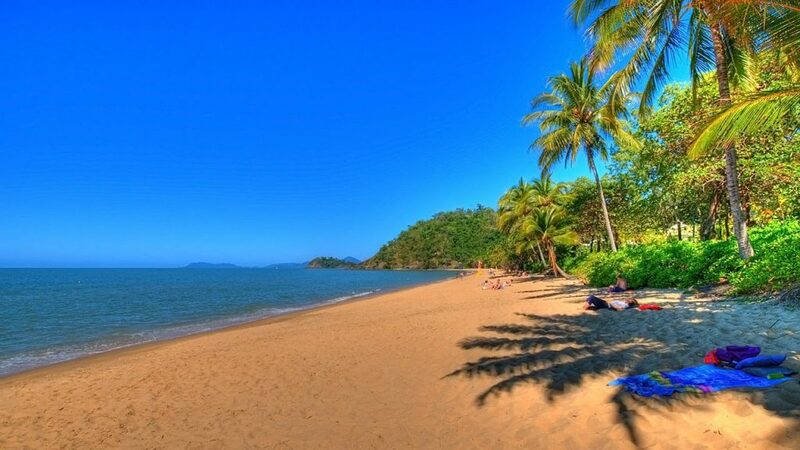 Holloways Beach is a peaceful beachside area, with a superb beach and yet so close to all the action in Cairns. There’s a little beachfront restaurant to discover and oodles of white sand begging for some beachcombing. Trinity Beach is a very private and secluded beach, perfect for a quiet break away. With a good restaurant and a lovely beach, it’s little wonder locals come to Trinity for a little rest and relaxation. Chic Pam Cove is an exclusive beachside resort area with some great cafes and restaurants. With a picture-postcard palm-fringed beach, a fun activity is to take a kayak tour around Double Island. If you’re staying anywhere in Cairns you’re sure to end up at Palm Cove for a spa treatment at the Angsana Day Spa, with gorgeous rooftop spa tents overlooking the sea.